Enterprise Resource Planning (ERP) for small and midsize businesses. Gain control of your finances & simplify supply chain, operations & manufacturing. Microsoft Dynamics NAV is an easily adaptable Enterprise Resource Planning (ERP) solution that helps businesses automate and connect sales, purchasing, operations, accounting and inventory management. Include core financials and trade functionality including Basic Financial Management; Basic Supply Chain Management and Basic Sales Management; Professional Services with a broad set of Business Insight and reporting functionality. For growing, midmarket or high functional need companies who are looking for an adaptive solution with Warehousing and Manufacturing. It comes with additional objects for extensive customisations. 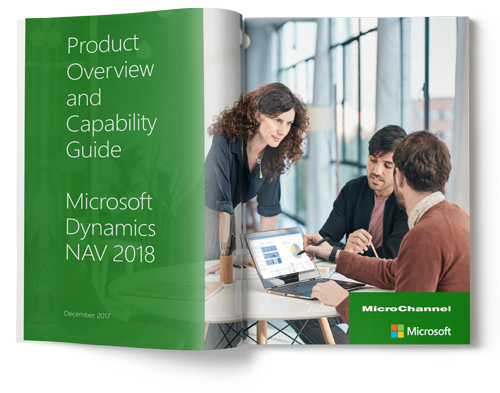 Download the brochure of the latest version, Microsoft Dynamics NAV 2018. Building on the robust functionalities in Microsoft Dynamics NAV 2017, the new version offers seamless integration with Office 365, faster set up, built-in Cortana Intelligence, improved automation with PowerApps and Flow and more.